From time to time an orchid displayed at a monthly meeting may not be true to its label. The misnaming of an orchid usually arises from indecipherable abbreviations or from transcription errors over a period time. Fortunately, the judges in their collective wisdom can usually provide the correct name for a particular plant. 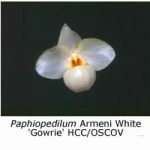 A recent meeting of the North East Melbourne Orchid Society provided an interesting example, where the label of the benched paphiopedilum clearly stated P. armeniacum ‘White’. 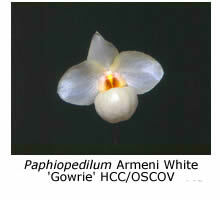 This name indicated that the plant was a species paphiopedilum, namely Paphiopedilum armeniacum, and that it had been given the varietal name ‘White’ to differentiate it from other cultivars of Paphiopedilum armeniacum. The plant carried a fine flower, long-stemmed, shapely and well presented, with a colour combination of an off-white background overlaid with pink and purple intrusions in the dorsal sepal, petals and labellum. 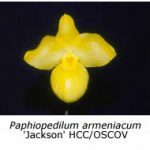 However, P. armeniacum, a recent (1982) discovery from the Yunnan province of China, is named for its glorious apricot (yellow) colour, whereas no hint of yellow was apparent in the benched plant. While this plant may have been an ‘alba’ form of P. armeniacum, and such forms are found in a number of paphiopedilum species, these are rather rare and usually known by judges and specialist paphiopedilum growers. The colour combination of white, pink and purple indicated the presence of red pigmentation, so obviously the benched plant was not a true alba variety of P. armeniacum. Although it was similar to P. armeniacum, the general flower shape and colour of the benched plant also bore similarities to Paphiopedilum delenatii hybrids such as P. Dellaina, a lovely pink hybrid resulting from the crossing of P. delenatii and P. chamberlainianum, registered in 1977. A check of hybrid references was enlightening. 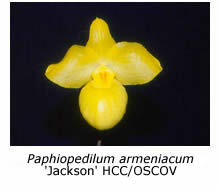 Following the introduction of P. armeniacum, hybridists had seized upon this new species, hoping to transfer its apricot-yellow colour to its progeny. Mr Haruhito of Takamatsu City ( Japan) was the first to flower a P. armeniacum hybrid in 1987. This crossing of P. armeniacum with P. delenatii produced ivory-white flowers described as rather like a large P. delenatii. The new hybrid, P. Armeni White, was registered in 1987. It is almost certain, in view of the similarity of names and the published description of this hybrid, that the plant benched at NEMOS was the primary hybrid Paphiopedilum Armeni White. While it does not have the intense golden-yellow colour that the hybridiser had hoped for, Paphiopedilum Armeni White is still a highly desirable orchid.